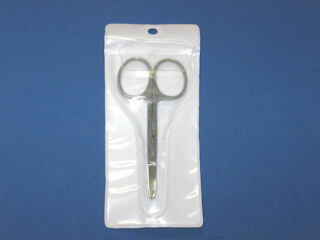 These are the little scissors with which Marie trims everything when it comes to cutwork and appliqué. 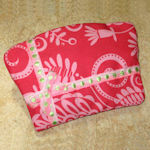 Those of you who have been to a class or sewing event with Marie have all asked for them. Some of you even managed to bribe a pair out of Marie's Treasure Box... Lucky Gals!!! But as promised by Marie, she's found a supplier and we now have them here for you on the website. 3 1/2" long trimming scissors. 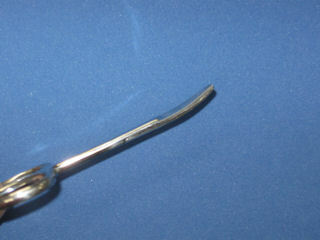 The blades are both blunt and curved to allow you to get really close to the stitches without cutting into them. Made of stainless steel. Never try to trim with the whole of the blades of the scissors. There is only one tiny bit of the blades that are really tight and offer a better bite. Cut just with that part and trim just tiny bites at a time. Your trimming will be much better and you won't have to go back and try to make it better. It's when we go back that mishaps happen. 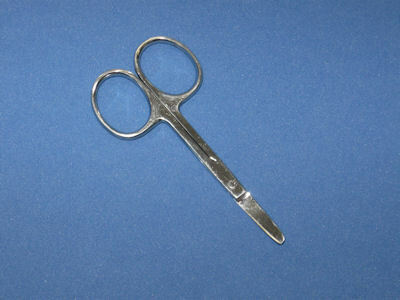 You'll get better results by resting the blade of the scissors right against the stitches and turning the scissors up towards you so that the blade clears the stitches. Cut and you'll be amazed at how much more precise your trimming will be! 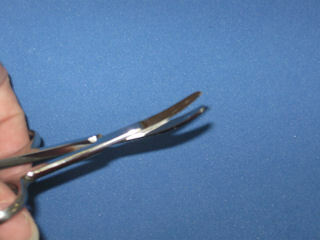 The scissors come in a protective PVC sleeve. NOTE: My Embroidery Haven is not a notions store. Any notion found on the My Embroidery Haven website are the notions that Marie uses everyday in the creation of her designs. These notions are made available here to ensure that My Embroidery Haven customers have an easy time finding them.